Subscribe to our mailing list for a free sample of "Reverse Gut Diseases Naturally"
A woman 47 years of age had a long history of Crohn’s disease was being treated unsuccessfully with pharmaceutical drugs. She had been on anti-inflammatory and steroid drugs. Her list of medications totaled ten which she brought in for her first appointment. She previously had two surgeries to remove portions of her colon. The patient was over weight; in pain from gas, bloating, bowel inflammation and diarrhea. Like so many tired of the battle with their health, she was clearly feeling at the end of the line which was affecting her lifestyle and happiness. I found this woman to be a classic Crohn’s disease case having the inability to digest carbohydrates and concentrated sugars. She also had poor absorption of nutrients and overstressed adrenals, thyroid, pancreas and liver. Her blood ph levels were acidic. In order to reverse gastrointestinal disorders, the diet must be addressed or a full recovery will not take place. I put the patient on a carbohydrate free diet with various restrictions in all food groups. I boosted her immune and endocrine system with natural substances. Supplement recommendations included natural anti-inflammatories, digestive aides, enzymes, colostrum and glandular support. The deficiencies of minerals and vitamins were picked up. After one month on the special diet, the woman felt better almost immediately from the dietary changes. She was happy to lose some excess weight as well. In the first 30 days, she lost twenty five pounds, and after a few months she lost forty five pounds. (Note: A person will not loose weight unless there is an excess of body fat) Quality protein and nutrition are not altered in the dietary regime. Because she had such a long and protracted history with the Crohn’s disease, she knew she was on a clear road to recovery as she was feeling vast improvement that she had never experienced previously. The patient quickly started decreasing her medications having a goal to be medication free. Now a year later the patient is still progressing and her appearance continues to change. With improved health, she had gained a renewed interest in herself and life. A thirty two year old male patient had a bleeding ulcer. He was in great pain and very weak. The patient was very concerned because he could eat only a few foods that didn’t give him great discomfort. He was extremely deficient of proper nutrients and was quickly heading in a downward spiral. The young man had been seeing his doctor and was waiting for a specialist’s appointment not yet due for another 3 months. The patient had been eating mostly starches and dairy which did not provide any nutrition. I needed to calm his gastrointestinal tract, and feed his body. I started him on a fresh vegetable juice regime and liquid chlorophyll. I took him off all solid foods with the exception to plain yogurt and broths unless they were tolerated. I did not treat his overgrowth of bacteria at first (helicobacter pylori) which is usually the culprit because his system was too inflamed. He did take Lactobacillus Acidophilus and Bifidus daily which can sometimes balance out the bacteria. I put him on enzyme therapy, glandular support, whey powder, nutritional yeast, gentle fibre, aloe vera and clay. For the first day or so, everything still bothered his stomach, but after that things started to turn around. After a few weeks, he was feeling so much better he started eating solid food and several items which I felt was too soon. I slowed him up on his happy eating. He continued to heal with no adverse effects. He had the appointment in place with the gastroenterologist, so he followed through with it. Since he waited almost a year to see this specialist, he wanted to see what he would have to say. He felt fine at that point in time and told the specialist with whom else he had sought help. Unfortunately when the specialist heard the patient had seen a non allopathic (alternative) doctor, he literally stormed out of the office and would not speak to him. The shortened appointment lasted less than 3-4 minutes. This kind of professional behavior is unacceptable. The patient’s well being is what matters – not someone’s ego. In the beginning of July, 2006, an elderly woman in her 70’s came into the clinic and had symptoms of swelling and pain in her joints – hands, ankles and legs. She had puffy eyes. She was also diagnosed with high blood pressure and high cholesterol for which she was on medications. Her other symptoms were fatigue and varicose veins the size of her finger on her leg. I felt her arthritis symptoms were food related, so I put her on a special diet earmarked to avoid specific foods. I suggested a single natural pain remedy product. I could have suggested several, but I felt if we removed much of the cause and irritation, her pain would decrease. She exhibited several symptoms associated with low thyroid, so I corrected the thyroid function through supplements and diet. The woman’s circulation and high blood pressure needed to be addressed also. I did not concern myself with her high cholesterol at this time because there were many other more urgent problems. The cholesterol could also correct itself through her dietary changes. Over six weeks, I saw the patient a total of three times which included two follow-up appointments – one two weeks later, and then another one month later. On the second appointment her pain had dramatically reduced. To her surprise, she said she could already wear her wedding ring again. All of her swelling had greatly reduced. She was a good patient and adhered to the dietary changes. Her energy was up considerably as well. On the last visit (third session) one month later, she displayed no symptoms of rheumatoid arthritis. Her varicose veins were completely normal. The woman had lots of energy. Her forty year old niece remarked, “I can’t believe how you can keep up and not be tired”. They had recently been away on a trip together. The patient also stopped taking her blood pressure medication against my recommendation. I would have had her wean off slowly and replace it with natural alternatives. But she felt great, checking it regularly and she thought there was no problem. She seemed to have quite an aversion to taking medication. As a result of her excellent recovery, I do not need to see her unless some other problem arises. The best part of all of this is that someone in their advanced years can turn their health around and be in control of their lives once again. In the early spring of 2005, a male patient of 70 years of age had severe knee pain and a baker’s cyst behind his knee. Surgery was recommended to remove the cyst. He wanted to proceed slowly in working with me which greatly limited my suggestions and choices for remedies. We started with natural based compounds of MSM (menthal-sulfonly-methane) and glucosamine sulfate combination joint formula. MSM is a natural anti-inflammatory. These substances are found naturally in our joint material. I recommended 3 capsules a day which equaled 1500mg of MSM plus the other minerals contained in the formula. I saw him two and a half months later and his knee pain was helped somewhat. I then doubled the dosage to equal 3000mg of MSM – 6 capsules a day. He telephoned me excitedly a week later to tell me his knee pain was gone. Approximately 4 months later, around October, I heard from him again – his pain was gone, but the cyst remained. I suggested we work on the Baker’s cyst. I recommended a combination enzyme formula including the pancreatic enzyme to be taken between meals. Just after Christmas, I heard from him to tell me his Baker’s cyst had gone away, and he still did not have any knee pain. In June 2006, I ran into his wife who told me her husband’s condition remained the same – no pain – no cyst. He had also reduced the dosage to half, which I had suggested when I last heard from him, but at that time he was afraid to reduce his dosage. I’ve chosen to write about this case to demonstrate that even though I had a whole arsenal of remedies to choose from, sometimes just a couple of things will work. Dosage may be the key and consistency. Research shows for MSM to reach its optimum effectiveness, 3000mg should be consumed. I often notice professionals recommending even higher amounts. A young man in the tenth grade came to me with the ends of his fingers covered in warts. The entire perimeter of all his finger nails were covered with warts. The warts were also on his face, lips, back of his hands, arms and other parts of his body. He had been seeing a dermatologist for one year without any success. He was in great pain and missed school because he felt self conscious. Socially warts are contagious. Warts are caused by a virus. The young man’s diet was deficient in minerals and other nutrients. I raised his immune system which in turn would recognize the virus and eliminate it. All of my recommendations were internal in nature with the exception of one external homeopathic remedy – Thuja which could be applied to the warts directly. The young man was motivated so he adhered to the new dietary regime – no dairy, no sugar, no white flour products and no junk food. The healthy regime included recommendations of foods and supplements which raised his immune system. After 3 weeks, I heard from his father to tell me the warts were almost completely gone. I had scheduled a follow up appointment with him on a 4 week interval at which time there was not any trace of warts – anywhere. I cautioned him to maintain a healthy diet to further strengthen his overall health and body. It has now been several months later, and he is wart free. 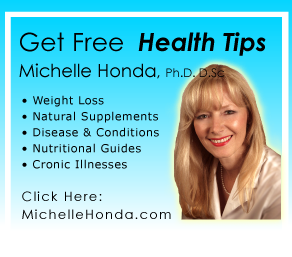 I originally seeked out Dr. Honda to loss unwanted pounds. I am the type of person who is very social and active and wish to remain so. I also recently acquired a dog. The weight loss program is very different than what I had known in past experience. Much more information and a large binder full of information to do with food and other body systems etc. Dr. Honda explained why I was having difficulty controlling my appetite and how my other health issues played a role in my health as a whole and my excess weight. Even though weight loss was my initial focus, I didn’t realize that Dr. Honda would deal with all of my health issues, some of which I wasn’t aware of before seeing her. In the beginning I started taking 6 different supplements plus her juicing program. Dr. Honda explained in great detail why I needed the item being suggested to me and also that some supplementation is always needed in order for our bodies to support us and function optimally. Many necessary elements are missing in the way our food is grown and I was never taught by any medical person what I should be eating to prevent disease and be healthy. My energy and general well being picked up quickly but I would still have the odd eating binge. The way in which I would describe my bouts of uncontrolled eating did not seem normal to Dr. Honda. She felt my long term usage of antidepressants had affected my brain chemistry and put together a program for me to wean off. I had been on Effexor and currently Pristiq. She had explained in the beginning that this was something she wanted to work on with me and to first get built up in several areas of my body, such as more energy, stronger immune, current gut issues needed to be worked on and so on. At this point in time I was feeing good and I knew physiologically that I didn’t have anything to be upset over. I am blessed in many ways. The new program for getting off these meds wasn’t difficult. With a couple of extra supplements for the short term, I was able to easily reduced and stop my meds for the first time in 20 years. I had tried on my own several times but within a short period of time I had to take one. Dr. Honda explained that there are natural alternatives to most meds since medications come from a natural source to begin with. I was given a tincture type herbal remedy that I could take whenever I felt I needed it and it was nonaddicting. I actually didn’t need it very much. Our Frequently Asked Questions (FAQ)>> page is very helpful for those considering working with Michelle. Michelle’s book, Reverse Gut Diseases Naturally is available now at the clinic and on Amazon.com.